When this owner decided to run and fish his battlewagon himself, nothing was going to stop him, not even muscular dystrophy. Easygoing Virginian Steve Jones loves to chase big fish. He also has a hereditary and slowly progressing form of muscular dystrophy that severely limits his mobility, especially in his legs. And since boats don’t come rigged and ready to meet the obstacles for the physically challenged, he recently decided to purchase and retrofit one so that he could run the vessel himself, as well as fight and land tuna and billfish. 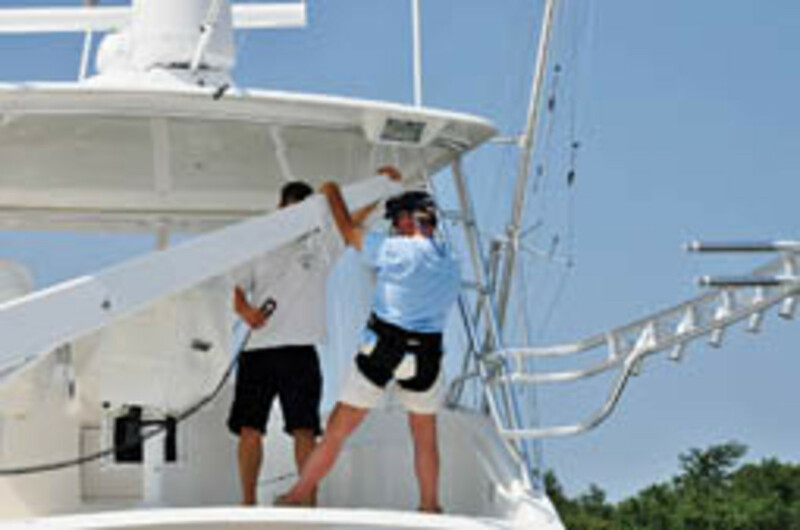 A davit with a wired lanyard allows the lift to be operated remotely and assist the owner in getting onboard. The boat’s rocket launcher was cut and hinged to enable the davit to swing out. 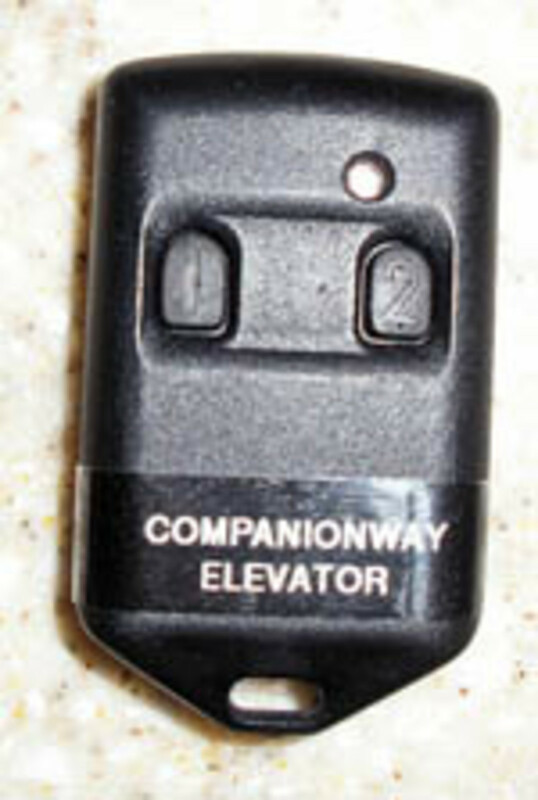 This key fob operates the boat’s interior belt-driven elevator. He talks to me with wide-eyed, childlike enthusiasm about how this boat project started just under two years ago during a late-summer fishing trip. 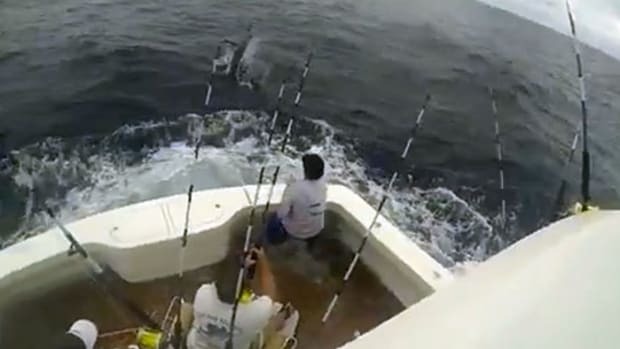 Jones relates that while out on a friend’s 56 Viking, the crew caught and released 20 billfish in one day. 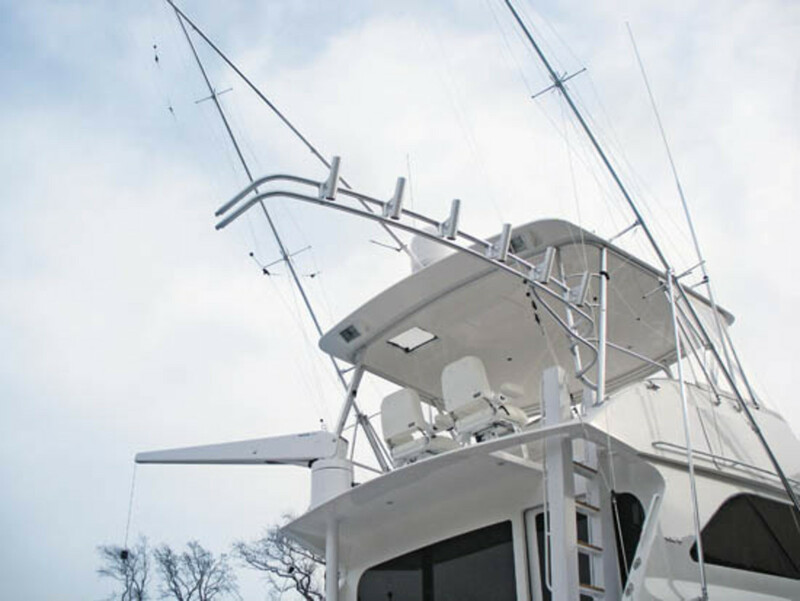 This angler, a self-made and successful businessman, says that he was bitten hard by the offshore fishing bug that day and decided that he wanted to buy his own bluewater-capable boat. Jones is a lifelong boater but had never owned anything larger than a runabout. 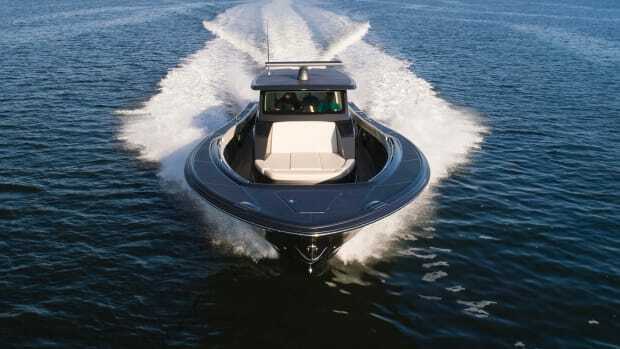 He tells me that he was eyeing two potential routes: The first one leaned towards a one-level, mid-30-foot center console that would enable him to work around the whole boat without any raised obstacles. The second path would be a much longer and larger convertible. 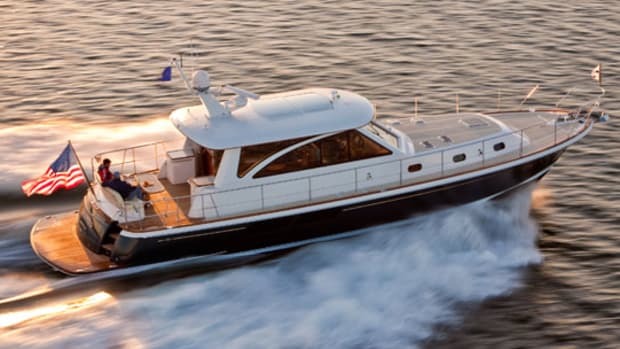 He chose the latter, and last spring purchased a 2005 52-foot Viking. 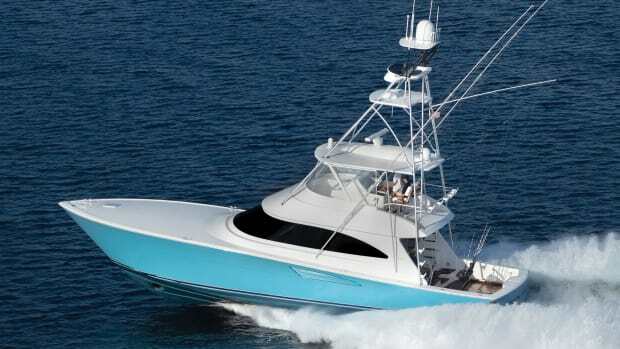 With the assistance of Viking’s mid-Atlantic dealer, Virginia’s Bluewater Yacht Sales, Jones says that he found a “pristine boat with low hours that was mostly cruised.” Bluewater’s Yachting Center crew was also instrumental in the design, manufacture, and installation of the upgrades onboard the boat now called Cuttin’ Up. The company’s vice president Earle Hall told me that the key for his staff to make this idea work was to simply listen to what was needed from the owner and then create a way to fulfill those needs. Jones says he began by going over his battlewagon to identify the obstacles for him, the first of which was how to get from the dock to the deck. “I didn’t want to rely on someone picking me up,” he says. Although a floating dock would enable him to slide over the gunwale, fixed docks would not be so forgiving. His solution was to add a davit behind the flying-bridge helm station with a seated harness that could be operated via a wired lanyard. 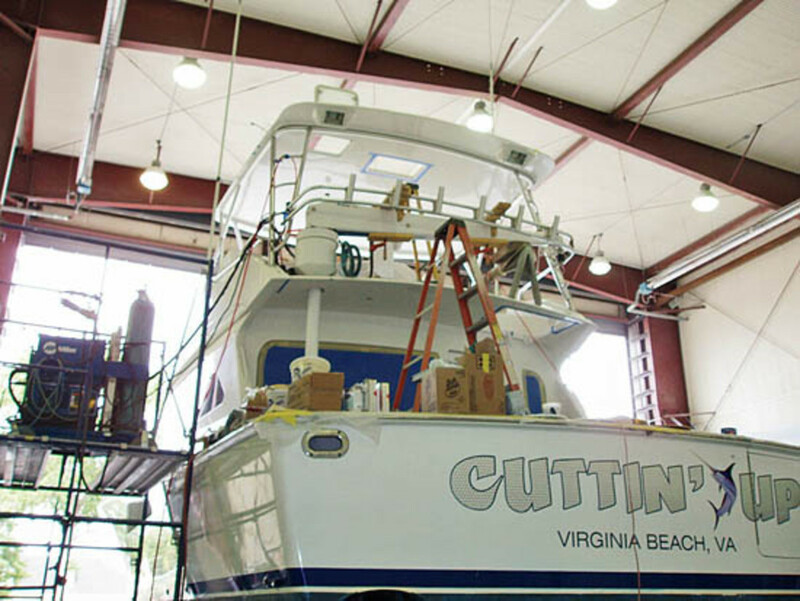 It took about eight weeks of work at Virginia’s Bluewater Yachts to complete Cuttin’ Up’s refit. Hydraulic and electric lifts have a featured role onboard Cuttin’ Up because Jones can’t lift his legs. He can, however, slide them from place to place on level ground. To create flush surfaces, a scissor lift was placed in the cockpit by the steps leading into the saloon. 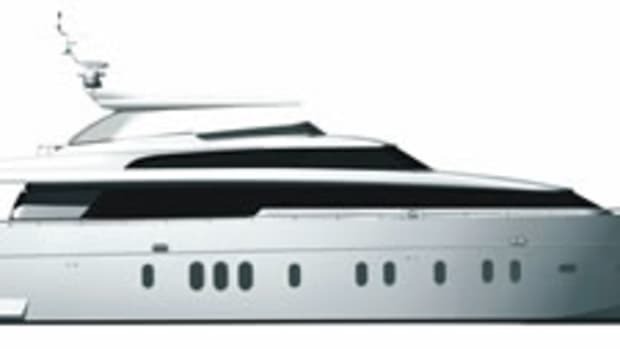 Jones simply steps on what looks like a hatch cover and presses a button on a palm-size remote control, and the hatch is raised level with the landing platform to the mezzanine and saloon door. Release Marine put a hinge in the fighting chair’s left-side armrest to ease the process of sliding in and out. There are two elevator-like platforms, too. The first one is hydraulic and is attached to the completely revamped flying-bridge ladder. This one—operated with the same remote as the scissor lift—brings Jones up to the bridge where he can then take a step and slide into his Stidd electric helm chair, which can spin around, raise and lower eight inches, and also shift fore and aft eight inches. 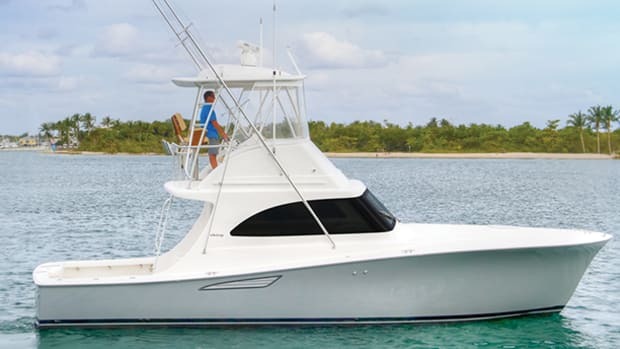 Jones happily recounts that while running the boat from this location last summer he spun his helm chair to face aft, hooked up a white marlin from a bridge rod, placed his legs on the davit, and successfully fought and landed the fish sans assistance. A plate travels up the wall of the head and allows the MSD to travel 30 inches for convenient access. 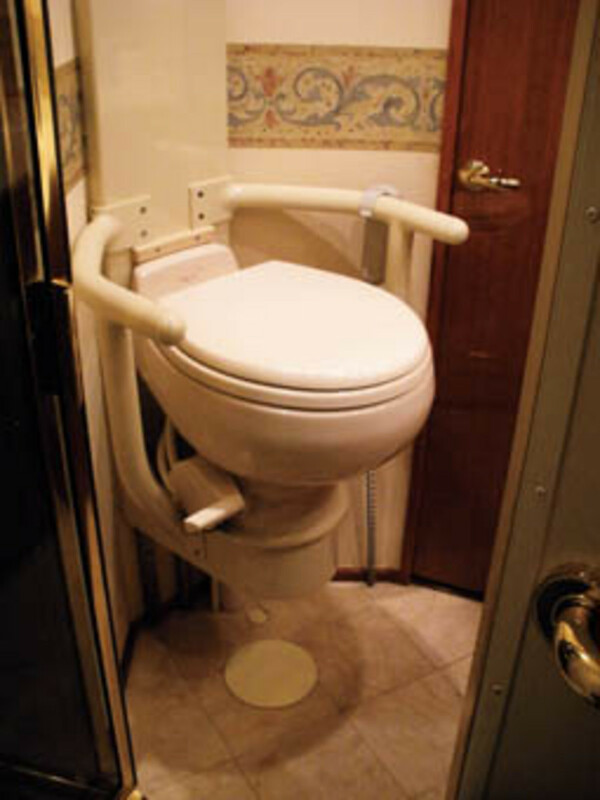 A second, belt-driven electric elevator, activated by a key fob or push button, is found in the companionway and brings this owner to and from the accommodations area. 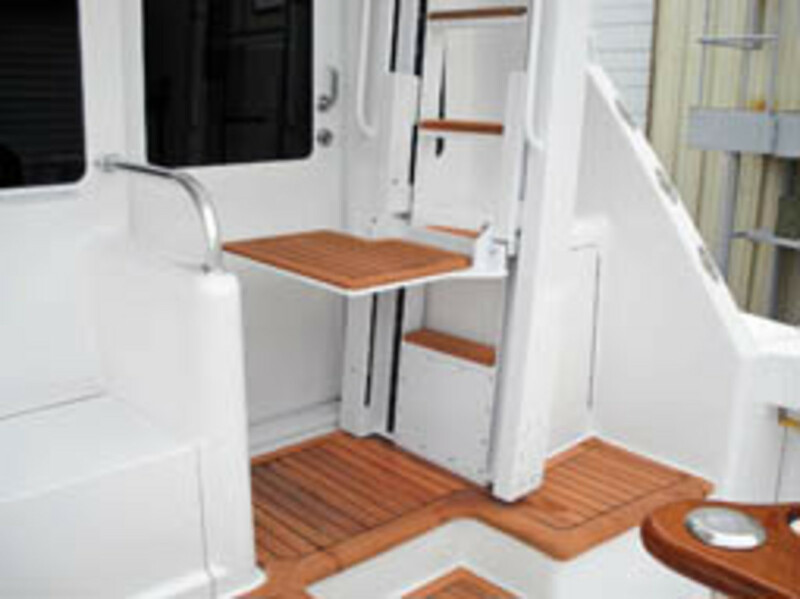 In its off position, the carpet-covered aluminum platform rests in the companionway sole. 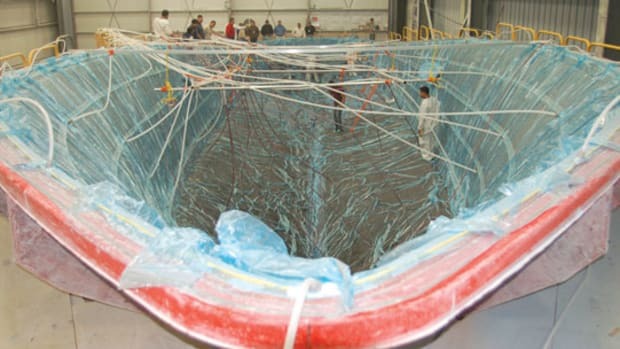 Jones says the key was to make all of these modifications, which were done over a lightning-quick eight-week period, to appear as a natural part of the boat. Jones’ proudest upgrade—the one that he calls “slick as a whistle”—involves the MSD. With the help of a plate that travels up and down the head’s wall, the toilet can rise up to 30 inches allowing for easy access on and off. As impressive as these modifications are, it’s the intrepid nature of this man and what they allow him to do that are remarkable. 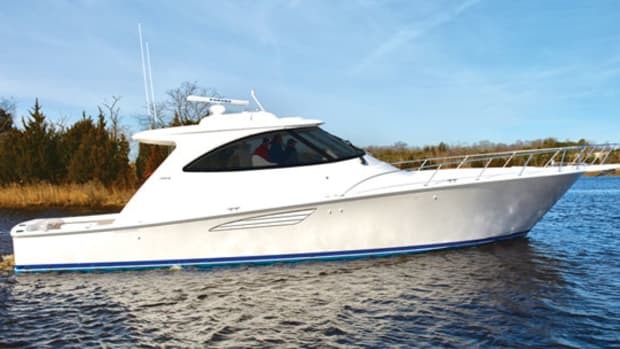 So what did this owner do after getting back his revamped boat in August? He sat in that Stidd helm seat and headed for blue water as often as possible. 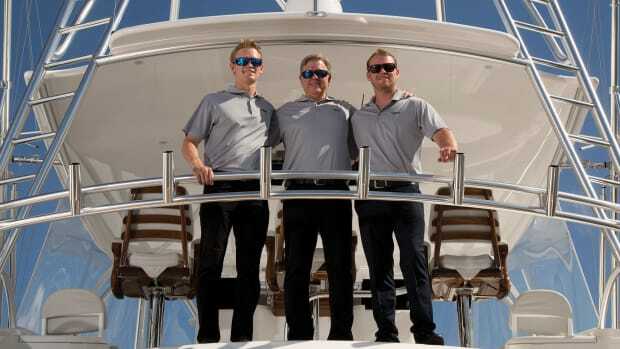 Jones and his fishing family, which includes his wife Debbie; sons Travis, Nicholas, Casey; and daughter Faith Victoria, managed to squeeze in five fishing trips before the offshore season ended. In total, the avid angling family caught one blue marlin, 38 white marlin, one sailfish, one wahoo, and numerous gaffer and bailer dolphinfish. A new flying-bridge ladder led to the construction of this remote-controlled elevator. But Jones isn’t resting on his past achievements. This owner-operator angler has an eye on the future with a couple of cruising trips planned as well as some hard-core tournament fishing on the docket for this summer. And expect to see Jones in the cockpit’s Release fighting chair, which was modified by the manufacturer to allow the left-side armrest to swing out 90 degrees. This setup enables an angler to slide into and out of it. Jones was excited to note that this chair could even allow someone in a wheelchair to slide into it and fight a fish. 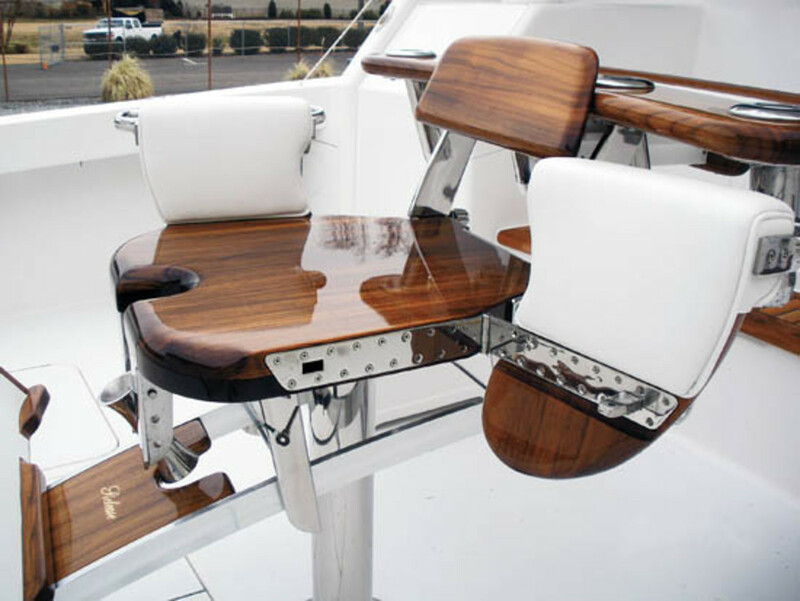 Actually, the modified chair is an idea that all anglers could benefit from as it eases the process of getting around the protruding footrest. And if there’s a need, the chances are very good that Jones will find a way to fill it.